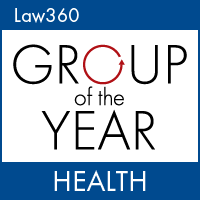 Zuckerman Spaeder LLP is pleased to announce that its health care practice has been named a Law360 Practice Group of the Year, an award given to law firms responsible for significant legal victories and developments that resonated throughout the legal industry in the past year. This award follows Law360’s recognition of D. Brian Hufford, the firm’s health care practice leader, as a Health MVP for the third consecutive year. "Our practice area is not just using individual cases and being successful, but basically building up legal theories," Mr. Hufford says in the article. "We're helping develop the law in an important way." The health care practice’s work on behavioral health cases is part of a broader fight to force insurance industry accountability and transparency, often by representing doctors and other health providers facing unfair billing practices. This cutting-edge work, which was developed by Mr. Hufford and New York partner Jason Cowart, is being led by a team of attorneys who are seeking not just to win individual cases, but to achieve landmark legal victories that impact future litigation. The recent return of partner Bill Schultz, who spent five years as the General Counsel for the Department of Health and Human Services, adds further experience, depth and strength as the practice continues to be on the forefront of healthcare litigation. The team’s’ work on behalf of mental health patients has gained high-profile support, including from the Department of Labor and former U.S. Rep. Patrick Kennedy. And in just the last several months both The Washington Post and CNBC have published Mr. Hufford’s opinion articles, which examine the insurance industry’s pervasive efforts to undermine the delivery of quality, affordable health care.